You may think that red, pink, or white annual flowering plants with thick pleated leaves are called "geraniums," since everyone calls them that. They look so great in pots and window boxes, and they are one of the most popular container plants. You might be surprised to know that these common plants are not geraniums at all. Botanically, they are called Pelargonium. True geraniums are perennials called cranesbill geraniums. The two look a lot alike and are closely related. The confusion with the names can be traced back to disagreements between botanists regarding classification. Really the most important thing you need to know is how to distinguish between the two. Perennial cranesbill geraniums will come back each year and zonal geraniums, those now classified as Pelargonium, are tropical perennials usually grown as annuals. They got the description as "zonal geraniums" because of the zone-like markings on their leaves. Zonal geraniums were first discovered in South Africa and if you have a similar, tropical climate, you can grow them as perennials. The four most common types of geraniums are ivy-leaf, scented-leaf, regal/angel, and the zonal varieties. Ivy-leaf geranium (Pelargonium peltatum): As their name implies, these geraniums have a trailing habit and ivy-shaped leaves. The flowers are smaller and less showy than zonal geraniums and the plants are often used as spillers in containers. Scented-leaf geranium (Pelargonium domesticum): Scented geraniums get their fragrance from the oil in their leaves. They can mimic all kinds of scents, like lemon, rose, mint, pine, fruits, and even chocolate. The flowers tend to be small and often insignificant and the leaf shapes will vary. Besides their ornamental and fragrant appeal, many can also be used in cooking. Regal and angel geraniums (Pelargonium domesticum): The regals, also referred to as Martha Washington geraniums are full, bushy plants with flowers in unusual colors and angel geraniums resemble angels with flowing wings for petals. Zonal geraniums (Pelargonium x hortorum): Also bushy plants and mainly used for containers and bedding, these geraniums have been hybridized for size and an abundance and colors of flowers; there is a good deal of variety. Oval leaves grow on succulent stems. The leaves often have zones of maroon or bronzy-green. Flowers can be single (five petals) or double and come in clear white, pink, salmon, orange, red, magenta, lavender, and bi-colors. Zonal geraniums grow in U.S. Department of Agriculture hardiness zones 9 through 12, which means this plant will die if the temperature goes lower than 20 to 55 F. So, this plant grows best in climates found in the southern U.S., California, and Hawaii. Zonal geraniums are basically tropical perennials. Although they are often grown as annuals, they may overwinter in zones as cool as zone 7 (Midwest and center of the U.S.) if they have some protection and the winter is mild. These plants will grow full sun or partial shade, but they will bloom best in full sun. The size of this plant varies based on the variety. There are some dwarf geraniums that will never get more than 5 to 6 inches tall and there are newer varieties that are being bred for height and spread. In general, most zonal geraniums are between 5 to 24 inches high by 12 to 15 inches wide. Zonal geraniums start blooming mid-spring and will repeat bloom until the first frost. It is recommended that you deadhead the entire flower stalk after the flower fades. It will encourage more blooms. You can start zonal geraniums from seed, cuttings, or transplants. Taking cuttings was the traditional method of propagating geraniums and maintaining favorite varieties. If you choose to take cuttings, make sure you only use healthy, vigorous plants. Geraniums can be started easily from seed, although the seed is usually for F1 hybrids. Seed geraniums are bred to be disease resistant and to bloom well in the heat of summer. Start seeds eight to ten weeks before your last frost date. They can take up to 2 weeks to germinate and should be kept warm, 70 to 75 F (21 to 24 C), and moist in the process. Scarifying the seeds before planting will help aid germination. Zonal geraniums are not heavy feeders, but since they are usually grown in containers, a light feeding with your favorite fertilizer, every two to four weeks, will keep them vigorous. Stressing the plants slightly by watering only after the soil has been sitting completely dry for a day or two seems to encourage more profuse blooming. However, do not leave them dry for so long that they start dropping leaves and declining. If you do not live in USDA zone 9 or higher, then your plants will need some winter protection. You can bring them in and grow them as houseplants, in a bright, direct light window. You could take cuttings in mid-summer and bring these smaller plants indoors, or you can overwinter your geraniums in their dormant state. 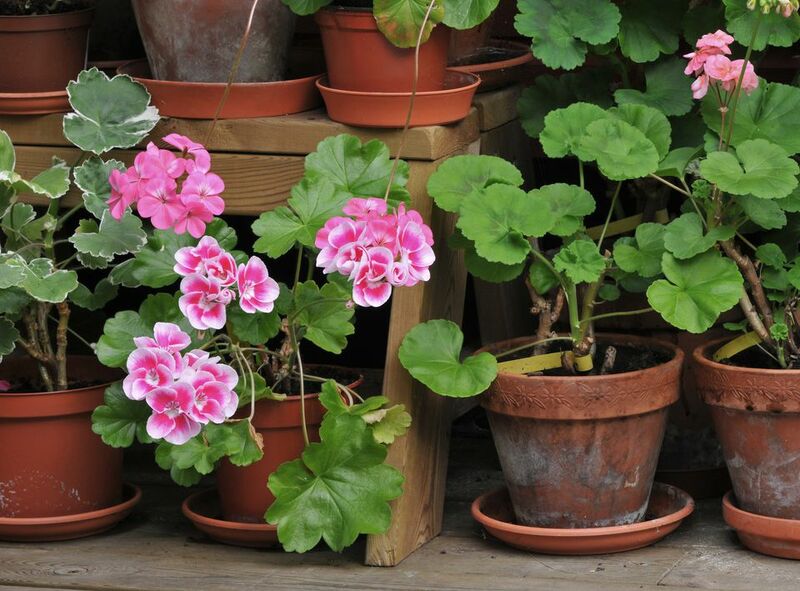 For the most part, zonal geraniums are not prone to insect pests, when grown outdoors. Indoors, aphids and whiteflies can become a nuisance. There are a few fungal and bacterial diseases to look out for, mainly stem or root rot caused by poorly drained soil, gray mold or botrytis, which causes grayish fuzz on the leaves and eventually a slimy mush, especially in humid or damp weather. Plant snobs look down their nose at zonal geraniums and claim the plants are garish and common. It is true that too many of the brightly colored plants can start to look over the top, but these beautiful, plentiful plants are excellent in all kinds of containers. Their color varieties are hard to beat. The brighter reds are very elegant all alone and pair well with flowers in equally bright colors like portulaca or nasturtium. The softer pinks and salmons complement blue and purple flowers and the lavender shades really stand out next to the chartreuse foliage of heuchera or sweet potato vines. Every year, it seems that there are more pelargonium hybrids to choose from. If you find a good source to order from, there are pelargoniums that are tulip-flowered, cactus-flowered, and some with spiky star-shaped flowers. There are also the fancy-leaved varieties, grown more for their variegated and patterned foliage. Just How Much Water do Annual Flowers Need? How Do You Keep Annual Flowers Blooming All Summer?